Great pair of headphones. Very durable, survives months of being carried around the city around my neck. Great quality, comparable to much higher value headphones. I like them more and more every time I try other headphones because of the superior sound and fit (even compared to more expensive headphones such as noise cancelers). They can be a bit tight on the head so storing them on something the size of your head (like a book) helps stretch them. I did have to chain sinnet the cord which might be bad for it but it has lasted 2 years so far. I have sat on them but I was able to press the ear piece back into the frame (the same way you can adjust them, you can pull them out). I've got those in November 2008. Since the day I've bought them, I always liked them. Only after a little while, my ears hurt. Must be because they don't fit into the ears-holes. Cord is WAY too long. I say, go for it. It's the best 45$ you'll ever spend if you are an audiophile or audio enthousiast. If you have large ears, the pads will be quite confortable. If they are medium, like mine, it'll hurt after a while but I don't think that fact should stop you from buying them. I think the cable is a little too weak. I guess I'll have to fix it soon. 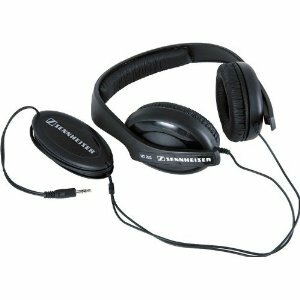 Fantastic bass response, good sound and noise-cancelling. At this price, it worths a lot. My initial plan was to buy a sony mdr 7506, but i ran out of money. I'm very satisfied. ear sockets are too small. Great value for the price. I like the 3mt long cable, helps me walk around the room as i listen to my music. they are nice and light on the ears, not recommended for chaps with ears bigger than the ear sockets itself. the Base is in the beginning to loud but when you have the headphones longer then a 1our or longer is will be normal. 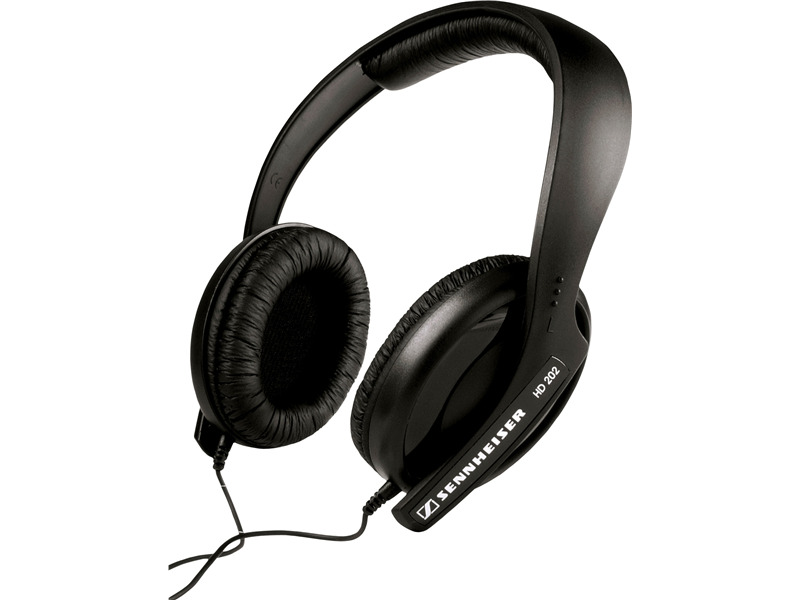 Good Headphones, Sennheiser gives good stuf for that kind of price. Ultra-Comfy for 3 hours plus. Could be tweaked up a little in the mid range - a tiny gripe. Otherwise faultless up to headphones costing 100 quid plus. You simply cannot do better for the money. Deep clean bass down at 30hz and reasonably well balanced sound. I used them for mastering. ie checking everythin=g is okay Now using HD 205. Not mcuh difference - HD 202 are much more comfortable. Amazing for 3 times the price. Turnkey are always busy, but always friendly. I've always felt welcome in there even if just browsing. Get these headphones NEW at Ebay for under 18 quid including p+p..
GREAT ! Best 30 $ I've ever spent. Definitely these cans are for modern music, as the bass response is great, and also the clarity in the highs is actually better than expected. That <0,5 % THD (Distortion) is really felt. I tried my best to made them hurr and I barely succeeded. Don't get the wrong idea. These are some cheap headphones, and I do agree that there is some room for improvement. But it beats any standard headphone by far. My friends were amazed when they heard it. I wouldn't recommend these for the mobile listener, since the output of a mp3 player is rarely enough for there cans to show their true potential. These cans are however fabulous for the home audio enthusiast, you just lay on your bed, benefit from those 10 feet of cable and listen to some quality sounds. Ideal for rock (even death or black metal), they also perform quite well in jazz tunes. Not that great in classical music as the highs from the piano and violin tend to be quite imprecise. Overall, it is a great headphone that fits any budget, and for that it has my respect. These are good phones, top of the price range. Cheap, but give a good entry level solution for people who do not use headphones that often and/or need them to be able to tolerate abuse. I've bought the HD202's for my girlfriend (couldn't stand her wanting some chinesse 5$ models) cause of the positive reviews on the net. Although i tried not to give them a test run I just felt it was my duty to do so. The phones are a bit rough on the outside, the plastic used is a bit hard and my overall impression is not that brilliant. They fit the head well enough and do not irritate the listener after the 72 min I had them on. Do not expect that these phones will work as good as your fathers cause nothing that good comes that cheap. The sound is not as clear as I expected it to be, but the surrounding noise is filtered out well enough. The treble is a bit to intense and is far from the crystal sound of the more expensive models. There's plenty of bass which is a bit muddy but that suits DJ's and mainstream listeners i suppose. The mid section is just not there being run over by the agressive bass and treble. These headphones are amazingly tough. I have sat on them, yanked them by the cord, and done other things that kill $300 headphones. The durability factor was one thing I was looking for when I purchased these. They have a nice (long) thick cord, so no shorts after two weeks of use. Lets move on to comfort. Its like there is nothing there, yet it isolates so much outside noice. The quality of sound is very comparible to that of bose. Absolutely crisp high-end, and extremely tight low-end. I am always amazed when I can hear things in a song with these headphones that I normally cannot hear. I am a sound engineer and prefer these to AKG or A-T headphones. I use these for leisure, studio, and live mixing. Bottom line. 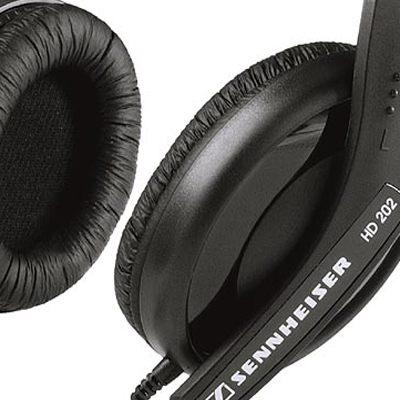 These are the best headphones in the market in relation to price. No one can touch these. I own three pairs in my household. The cord is a bit long for me. I have never had any problems. I am guessing these headphones will outlast me at the rate I am going .